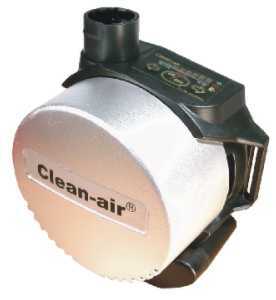 We are the UK and European supplier of "Clean Air" Battery powered Respirators. 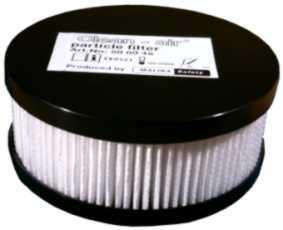 All products are CE marked and comply EEC EN standards. Our comprehensive range of the Clean-Air "Go Anywhere" Battery operated Mobile Powered Respirators, providing unrestricted breathing protection to suit everybody's purpose. 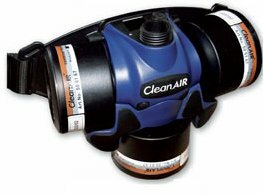 The "Clean-Air" Basic 2000 Systems use a single, replaceable high efficiency filter to protect against liquid or solid aerosols, toxic dust and smoke at flow rates between 160 to 210 l/min. 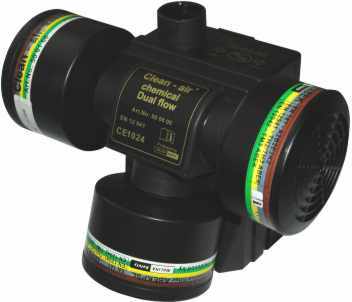 The New "Clean-Air" Chemical (CAC) Systems feature three 40mm Screw-in-Thread cartridge filters to protect against Dusts and Fumes, Organic or Inorganic Gases and Vapours, Sulphur Dioxide and Ammonia Vapour, MDF and Hardwood Dusts. New QuickLock version New Clean Air Hood CA-1 available in Blue or Orange with New QuickLock connector for respirator hose. 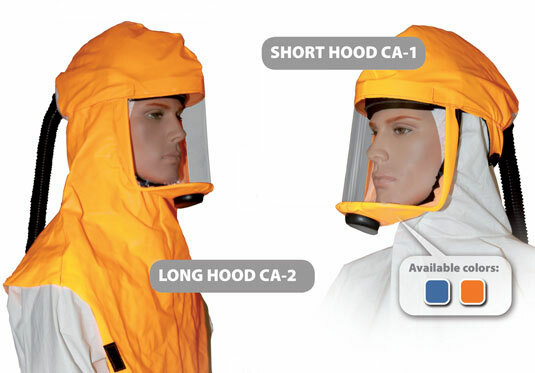 Suitable for Dust and Chemical Protection Respirators shown below: Models CA Basic 2000, Chemical 2F, Chemical 3F, CA Chemical DF. 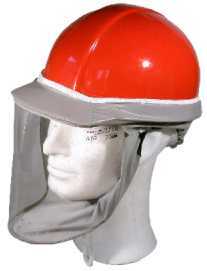 Welding hood CA-20 is of course designed for use with powered respiratory unit as well. Innovative solution of an integrated airduct integrated into the helmet shell and an individual adjustment of airflow direction provide the highest protection level. THE ULTIMATE WELDING CONCEPT – WELDING HOOD CA-20 A new generation of welding helmet CA-20 with welding filter incorporating advanced Angular Dependence Compensation plus (ADC plus) technology uses a revolutionary concept of liquid crystals. This new welding filter with ADC plus technology has gained the DIN Plus certificate with the best possible results of optical quality (1/1/1/1). All prices are subject to VAT (see below). Delivery: 24/48 hour service to anywhere in the UK mainland. We can also deliver to the Channel Islands, Isle of Wright, Ireland, Isle of Man, The Orkneys and Europe, subject to a delivery charge, which will be advised before goods are dispatched. 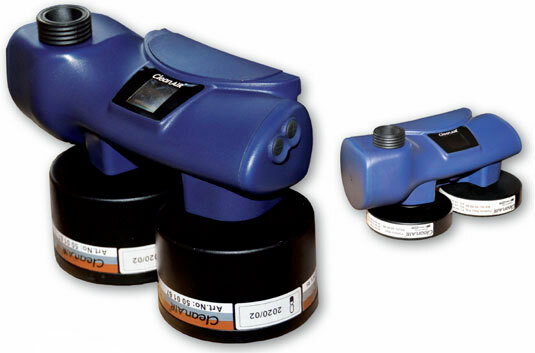 VAT: All prices quoted are subject to VAT, payable on all orders delivered in the UK. Export Orders are exempt from VAT. New Accounts Welcome to UK registered Limited Companies. Simply select Account Customers option, place your Order Online and then fill in the Credit Application form on the Order Acknowledgement page. Please note you will need your Company Registration Number for the application form. Schools, Colleges, Health Authorities, Local or Central Government Departments We will automatically open an account on receipt of the first order, simply place you order using the Account Customers option. Registered Names: Mr. Chemiclean, Chemiclean , Chemiclean Products are the copyright of Chemiclean Products Limited and all rights are reserved E. & O. E.